Hello, Monika from Splendid Willow here. It is such an honor for me to be here today. My blog is focused on interior design and therefore I can’t help but start by sharing an inexpensive DIY design project with you – perhaps for the summer house. I think whoever came up with this is brilliant! A few vintage wooden crates – and voila! A lovely and personal area to store (or even display!) all summer shoes! Maybe something to hunt for at the summer auctions and flea markets. From shoes to summer skin. I don’t know which one of my “secret tips” does the trick. Or if it is a combination. But these products have definitely improved the look and feel of my “over four zero skin”, and I am by no means an expert in this area! First up is a gadget that I recently invested in, its called Clarisonic. Yeah, yeah, I thought for myself when the sales person at Sephora told me that it would do wonders for my skin. How many things and products have I invested in that made zip, nada, zero difference to my skin. But I’ve got to tell you this gadget has really improved texture. My skin looks brighter and healthier and appears smoother. 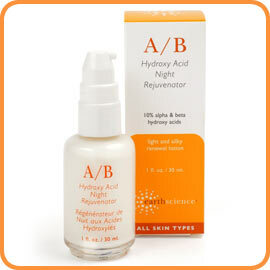 Before I hit the sack, I slap some Hydroxy Acid Night Rejuvenator by Earth Essentials on my skin. This cream does not make me look like a sad puff ball when I wake up! It just looks fresh. For day cream I use the Age Reversal Face Cream by Desert Essence.. I like using as many natural things on my face as possible – and my sensitive skin really responds well to this cream. As far as makeup goes, I’m a pretty natural kind of girl. A little bit of mascara and purple/brown eye pen for my green eyes and lip gloss. With a little summer tan, I love putting on Mac’s Viva Glam VI lip gloss. It is natural with some edge to it – and it stays on! Let me add some shoes to that unique storage area in the first pic. 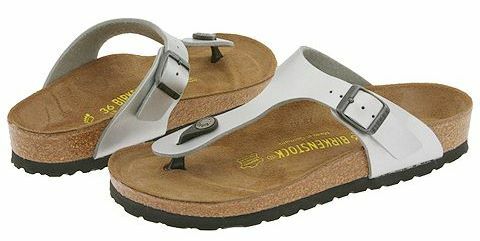 I practically live in these silver Birkenstock sandals, in the summer time! This is the second year I trot around in them! (I read somewhere that Heidi Klum is also a fan!). They are hip in silver, look great with a sun tan and work with white jeans, shorts, as well as a feminine summer dress. And they are Birkenstocks, which means they are oh-so comfortable! I even put them in the washing machine, with so far no damage to the leather. Those were some of my personal things I go nuts for this summer. Thank you for inviting me, Sue. 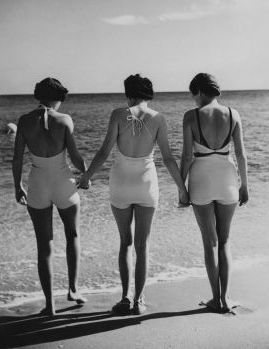 Summer Hugs to all of you. And an extra warm hug to Sue! perfect! i have wooden crates outside that i use to set plants on – but using them inside would also be cool, i hadn't thought of that! Fab style secrets. Anything that says age reversal gets my immediate attention! Love MAC. Off to Splendid Willow! Thanks for the secrets. I'm a big Clarisonic fan too. love the crate-storage. great idea!!! i heard about that clarasonic thing – hummmmm – maybe i'll give it a whirl! That Age Reversal cream seems like a must-have for aging gals like me! Great Summer Style Secrets – yet again! will rub off on moi! Love the wooden crates idea. I am also a fan of Mac lip gloss. Wouldn't go anywhere without my lippie, as my 3 year old calls it! Love Monica and her blog! Great suggestions. Darnit! I was at a garage sale on the weekend and saw very similar crates for $3 each and didn't get them! I am regretting it now! Monika, such great summer tips and I must have those sandals!! Sue thank you for featuring one of my favorite blogger friends! Absolutely love the crate idea! And the cream tips. I am always looking for good facial creams. Haven't had much luck in a while! Will check these out! Great beauty tips! And I totally am wanting to buy that Mac lip glass now. A gloss that stays is something worth buying. I love me some MAC and Berkinstocks! I have those sandals on right now!!! LOVE THEM SO MUCH!! and those wood boxes holding the shoes- GENIUS! Ahhhhhhhh, I've been wanting the Clarisonic SO bad! So fabulous, Sue! Those silver Birkenstocks are cool, comfort combined with glam! Off to check your guest post! XO! Will have to try some of these products and visit her blog! I am SO tempted to purchase the Clarisonic…. Love all your suggestions M! Especially you shoes! Keep it real and simple! Sue dear, thank you so much for inviting me. I had a fun time putting together my little list. It is late evening here in Stockholm, the suitcase is packed (and filled to the brim with Swedish treats! Yes, I had to sit on the suitcase in order to close it properly!) and tomorrow I will be on my way home! Yeah! I love those wood crates…but even moreso – loved to here about the skin products. I will be trying these!! I'm Crazy for my Clarasonic! Just love it! And now it comes with a body attachment too! Love! Hi sweety! thank you for visiting and following my blog.. im following you too! and wow you have so many blogger friends already! love these summer tips! always excited to hear about new skin care products etc. And the crate idea….too awesome! All great things in the summer. Big fan of the summer shoes crate display…and I have those Birks (though int he natural color) and love them. 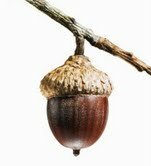 They are great for this time of year. Wooden crates are great and off a relaxed feel to a home…great way to welcome guests in on a summer day! 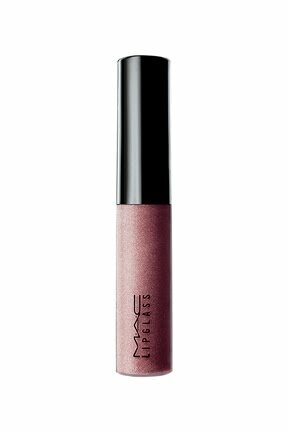 I've been searching for a new lip gloss…and I think I've found it!! Great post! She had me at that photo with the pink rainboots — DYING. OOh! 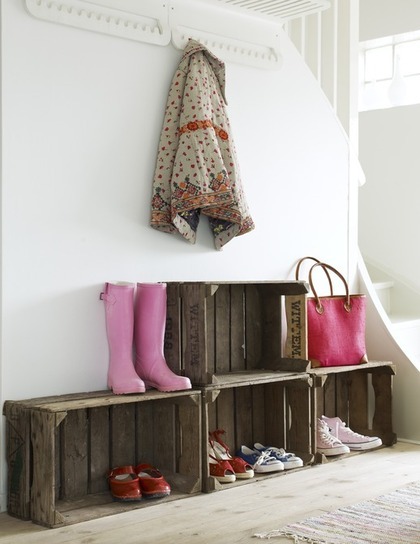 Love the crate/shoe storage idea! And love the review on the Clairsonic! I want to try the clairsonic!!! i love that picture of pink boots on top of those crates…thank you for sharing splendidwillow dearie! We are excited to hear you invested in a Clarisonic. Sounds like you are well on your way to healthier looking skin in just a minute a day. If you ever have product questions please let us know! We're happy to help. Find us on Twitter @Clarisonic or via email info@clarisonic.com! Happy Cleansing! I've been wanting to try the Carisonic…this may just be my push! !